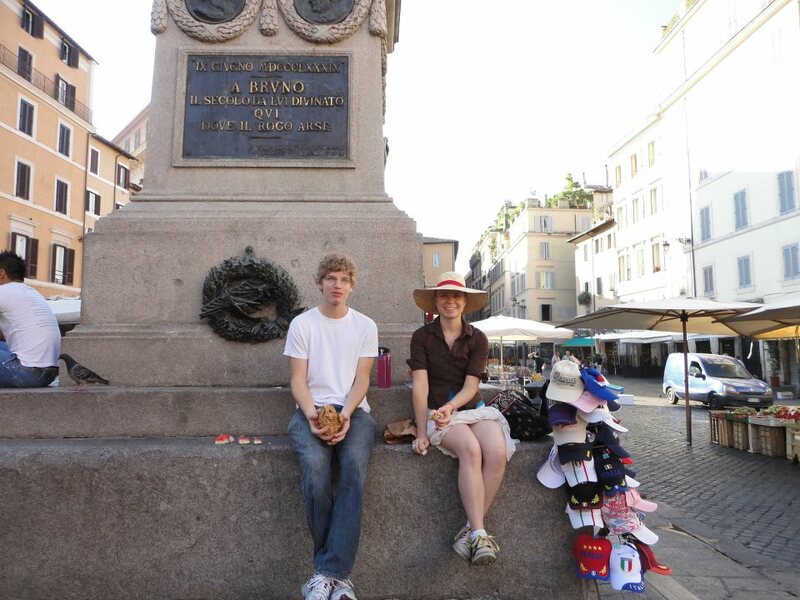 Mike and I eat fruit in Rome. Please take note of how awesome it is to be in Europe with friends. There are three things I want to tell you, but they don’t necessarily segue well, so I’m just going to use numbers. In my mind, I imagine the couple to be kind of confused because they don’t actually understand what is going on, but they’re also blissfully in love so they’re just happy to be alive and partying. I also imagine that Mary overhears this conversation and smiles a knowing smile. Gosh I love this story. I laughed and he laughed and we laughed together. A few days later I left for a few hours to do group-leader things and double-check on tickets and numbers at a subway stop kilometers (Ha! Europe!) away from where we were staying. When I arrived back, I walked towards our accomodations and my group spotted me. I realized they were right. I am their mom. (For the trip, at least). Here I am again, then, about to take you lovely people on a pilgrimage that will, quite possibly, change your life. Taken in Rome as well. 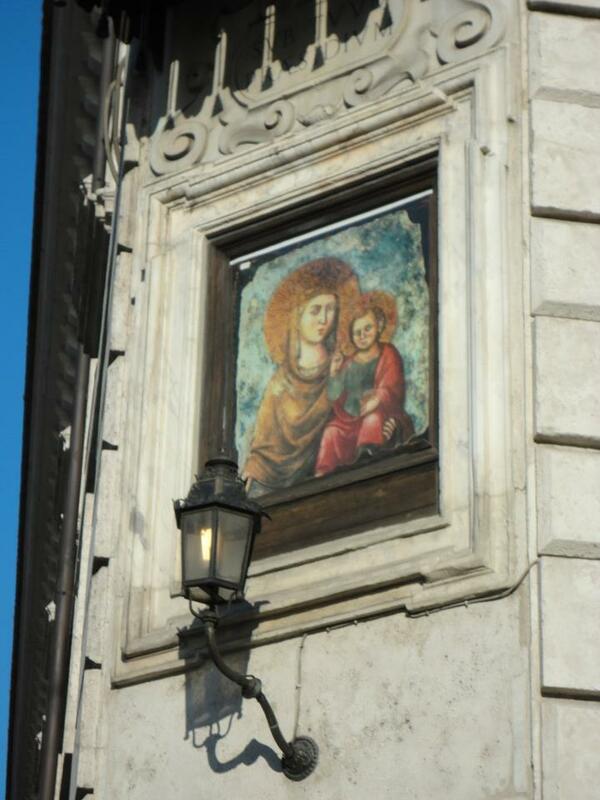 It’s a picture of Mary and Baby Jesus (the Bambino Gesu! :D) overlooking the streets where we walk. It’s a lovely Italian tradition. And, I must say, they do a pretty good job as there are MANY reasons there should be accidents…and yet, I didn’t spot a single issue. I don’t know how this is going to work out, friends. I don’t know who is going to end up on the trip. I don’t know how I’ll find food I can eat. I don’t know where we’ll be staying for everything just yet. DID I MENTION I’M NOT EVEN SURE OF EVERYONE WHO WILL BE ATTENDING YET? But, you know what, I’m also astounded. People I didn’t expect to hear from are responding to the invitation. And, by golly, I’m excited to hear about it. It’s because I love Jesus and Mary and, in my mind, they’re working behind the scenes just like they do at the Wedding where water-is-turned-to-wine. Mary is pulling strings and Jesus is working miracles. It’s what they do, ya’ll. So, let us rest in this knowledge, eh? If you’re one of the folks who will be joining me…I’m excited to have you. I’m praying for you. I’m fasting for you. I’m looking forward to growing with you. Be excited. Big things are going to happen/ are happening. And also: we have a Holy Family in heaven who care for us. Let us run with perserverance.